"Yes I did receive the Angel Ashes "Second Edition". 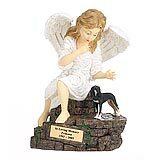 It is beautiful and I know each time I look at it I will remember my beautiful Maggie. Thank you for such prompt service." 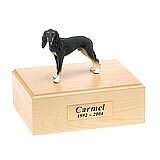 All available Saluki dog urns and memorials will be displayed with the figurine on the Saluki urn you select and in the appropriate size.